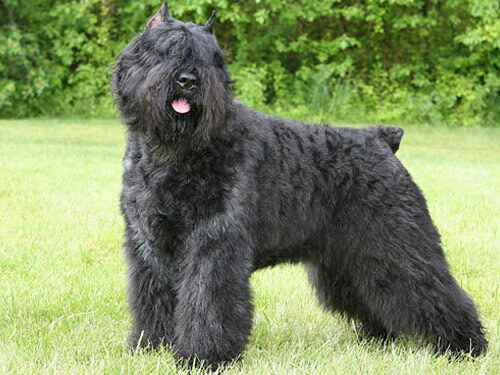 The Bouvier des Flandres is a strong and stable breed that can be a devoted companion. If this breed receives the proper amount of physical and mental stimulation, it can make for a well-mannered house pet. The Bouvier des Flandres is a self-assured breed that also has an eagerness to please its owner. Because of its natural protective instincts, it can be aggressive around other people and dogs that it is not familiar with. However, this breed is excellent with children and has a tendency to nip at their heels in a playful manner. The Bouvier des Flandres is a breed that requires a significant amount of mental and physical interactions. This is a breed that needs continuous activity in the form of jogs, walks, or games. The Bouvier des Flandres has the ability to survive outdoors in climates that are moderate. This breed does do well as a house pet as long as it has access to a yard or the outdoors on a daily basis. The coat of the Bouvier des Flandres is harsh and does require combing at least once each week. It may additionally require shaping every few months and stripping if it is a show dog. The major health concerns for the Bouvier des Flandres are CHD (canine hip Dysplasia), elbow Dysplasia, glaucoma, and SAS (sub-aortic stenosis). The only minor health concern for this breed is hypothyroidism. It is suggested that the hips be regularly tested. The average life span of a healthy Bouvier des Flandres is ten to twelve years. The Bouvier des Flandres has a natural herding instinct and has its origins in assisting farmers to herd their cattle in the area of southwest Flanders and the French northern plain. This herding ability earned this breed the Bouvier portion of their name, as Bouvier is French for cowherd. This breed has also been referred to as the vuilbaard, or dirty beard, and the koe hound, or cow dog, in the past. In addition to having the ability to drive cattle, the Bouvier des Flandres also acted as a guard dog for other animals on the farm. This breed initially existed in various colors and sizes, as the physical appearance was not the dominating characteristic in the choice to breed. Instead, the breeding stock was selected by their capabilities as working dogs. This breed may have had its origination from a combination of the mastiff, sheepdog, and other spaniel breeds. The exact derivation is not certain. While a standard was drawn up in the early part of the 1900s and this breed gained some popularity, the majority of these dogs were diminished during the time of World War I. There were a few Bouvier des Flandres that survived this era and one of them was used to revive the breed through its offspring. This dog was known as Nic de Sottegem. The breed gained the des Flandres portion of its name in 1922 when a revised standard identified this specific type. The Bouvier des Flandres became a favorite in show rings in America around the 1930s, but have never gained extreme popularity overall except for in the show ring and at herding trials.